I may not have grown up with technology the way today’s kids do, but I got my first personal computer, an Atari 800XL, when I was 16 or so and taught myself to program it. I wrote my own version of Lunar Lander and a Mandelbrot set generator (where images about 300 pixels by 100 pixels took over 24 hours to generate) and then went on to a Computer Science degree in college. I’ve been online since I was 18 and have worked with technology non-stop since I left college and, later, grad school. My point is that technology is a fundamental part of my life. I use it for just about everything from writing to researching to communicating and leisure. And, of course, employment. I take this stuff for granted. The other day, my wife and I were talking to another parent of an 8th grader. This other parent is older than we are and was talking about how in their house, they often text their teen rather than bellowing across the house. He told the story as if he were telling us some great parenting secret, some amazing technology at home tip he had discovered. How clever! We were amused but I later thought about this and realized that wired parents like us are the exception, not the rule. Sure, there are plenty of you out there (and I would guess that the readership of this blog would trend in that direction by virtue of the fact that this is online in the first place!) but there are even more parents for whom this technology is much more the Undiscovered Country than Main Street. It helps account for why there is so much misinformation about teen use of technology: many parents just don’t understand social media beyond their own interactions with their friends on Facebook. 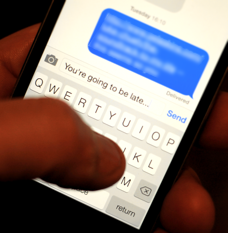 Texting: Texting is insanely useful. Especially when our son is taking forever in the bathroom in the morning with the fan going, the heater going, and the music playing. Bonus: we can hear his phone vibrate on the sink so we know he got the message! It keeps us from bellowing across the house. And it is very useful when he has what has become a weekly sleepover with his best friend. It’s 2AM and they have woken me up being loud down in the basement/family room. I’m exhausted and half asleep. If I get out of bed to walk to the top of the stairs to call down to them, I’ll wake up fully. Instead, I roll over and text, “You woke me up. Be quiet.” He even knows not to text back a reply. They just get quiet. I go back to sleep. Following: There is a fine line between keeping tabs on your child and violating their privacy. We follow our son on all of the various social media sites he is on. He gets annoyed at times about this but our policy is that when he was 13, when he first was allowed to go online and join these sites, he had no privacy at all and by the time he is about 16 or 17, he will have complete privacy. Between here and there is a spectrum of gradually increasing privacy. He’s 14 now and we’ve backed off somewhat. We read what he posts but we only spot check his conversations in any public space (Instagram comments and stuff like that). A few times he’s crossed one or another line and we made him delete the offending comment and explained the issue we had with it. Not in an angry, punishing way, but simply to educate him and explain how certain types of comments or behaviors can be damaging to him or hurtful to others. As a bonus, he posts regular pictures to Instagram of his art projects at school. Since, like all teens, his only report about school when we pick him up is that it was “fine,” these pictures are one of our only ways to follow the development of these projects. Find My Phone/Find Friends: These two bits of stalker-ware from Apple are insanely useful. Our son’s school is in the part of town that hosts a number of colleges. Two blocks from school is the “main drag” with stores, restaurants, street vendors, and more that is heavily trafficked by college kids. Our son likes to wander that street with his friends after school (before you judge, read “Free Range Kids” (non-affiliate link) and then come talk to me.) He knows how to get to and from school but is lousy at being able to tell you on the phone where he actually is at any given moment. And since all the streets are one-way around there, it is nearly impossible to pick him up without knowing exactly where he is. Enter these apps. More than once my wife is in the car trying to pick him up and I’m at home on my iPad tracking his movements and telling my wife where to go to find him. Works every time! This is also useful for when he goes on walks around the neighborhood and I want to check up on his location without calling him and making him feel like we’re watching him (though, to be honest, I think I only did this the first time he went out alone like that). As an added bonus, the Find My Phone app allows you to make the other phone emit a loud, piercing set of beeps (you know, to help you find it). When I am waiting outside of school to pick him up and he’s clearly gotten lost talking to his friends and forgotten the time and cannot hear his phone (because it is probably in silent mode from being in school all day), I can make his phone make a loud beep anyway to get his attention. There’s more but this gives you an idea of some ways we’ve found technology helps us all out. We’re still struggling with the concept of phone numbers and calendar events. I haven’t included him in any of our shared calendars or address books because I am scared he will accidentally delete something critical like, say, a job interview or a doctor’s appointment or something. I should get over it and either trust him or find a read-only solution. More than once it has been a problem that he hasn’t known about a given upcoming event or had a key phone number handy. Clearly there’s room to grow. And lest you think we are all tech, all the time, we are big fans of shutting it all down and spending some quality family time together. You know, father and son sitting across from each other playing some Magic: The Gathering. Using the phone as a score keeper.